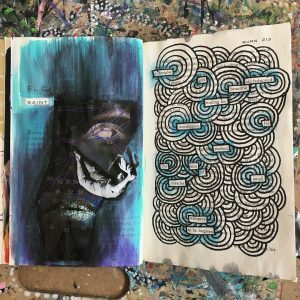 Blackout poetry and altered book pages can help you stretch your creativity and tap into your intuition. I recently volunteered with the South Texas Art Therapy Association to run a booth at Maker Faire Austin. At our booth, visitors could create blackout poetry, altered book pages, and Random Act of Creative Kindness Cards. It was so great to watch visitors slow down and take the time to be creative. Many people seemed to approach the activity as a chance for relaxation or fun play. A few other people worked with a quiet intensity that surprised us in this setting, sharing with us poems and collages of deep personal expression. 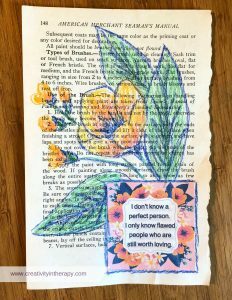 I love re-purposing book pages – adding to a collage, cutting out scherenschnitte style paper art, or working in my altered book art journal. The pattern of the words on the pages creates interest and texture in the artwork. 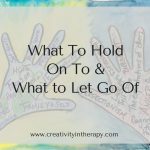 But beyond using the book pages as simply an interesting paper, you can use the book page to inspire your art through drawing, painting, or poetry. 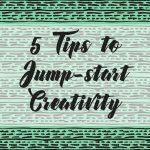 I find that this is an exercise that helps me to break out of a creative rut. The inspiration of the page brings up new ideas to play with and explore. In addition, I believe that there can be value in working within structure and limitations. If I take a random book page and commit to somehow creating a poem and work of art from it, I am stretching my mind to be creative. And the resulting art is likely to be something very different from my typical art or what I would choose to do if given unlimited free choice. It’s also a great way to practice listening to your intuition or tapping into your unconscious. By letting your mind notice what stands out to you, you may reveal something that you are needing to hear or put into words. 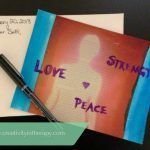 By taking the message that results and thinking about what it means to us or why we need to hear it, we are projecting something from within that can then be explored more fully. Not every book page is going to lead to the creation of a meaningful, insightful poem or work of art. Sometimes it’s going to be silly, odd, or just fun. And maybe that sense of fun or the experience of accessing your inner creative voice is sometimes just as important as new insight. 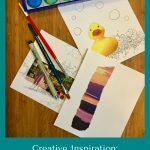 So whether you use book pages to inspire playful creativity or as a tool for deeper reflection, it’s an expressive arts activity that is worth exploring. 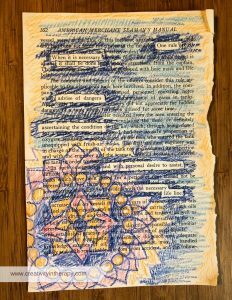 Although altered book pages and blackout poetry can be different exercises, I’ve included them both in this post since they go together so well. 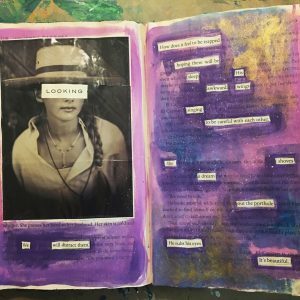 You can choose to do poetry only, visual art only, or a combination of both on your page. 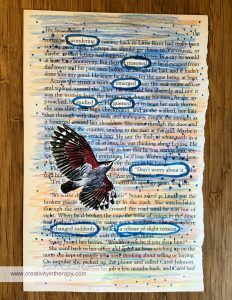 Use the words or images on your book page to inspire your artwork. 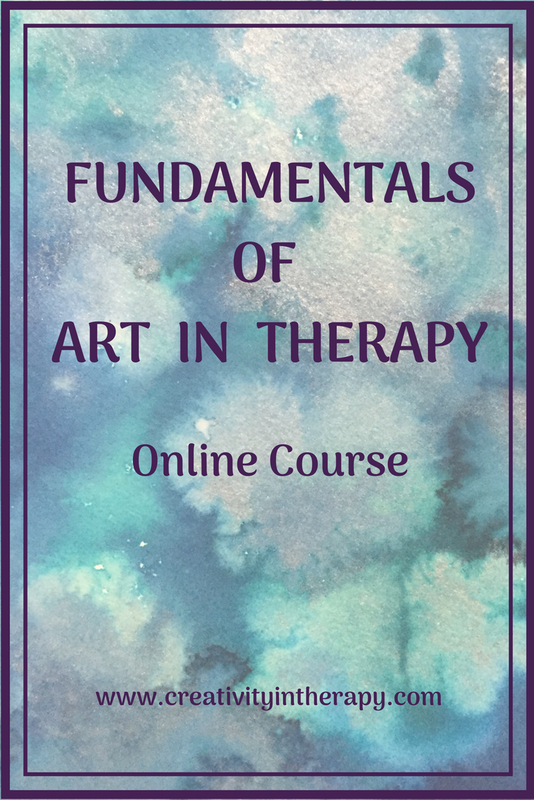 Add paint, drawing, or collage material to develop your art work. You can also cut up the pages, use multiple pages to create layers, or fold them into shapes. Start with a book page or other piece of text. Scan your page and circle or underline the words that stand out to you. The words that jump out to you initially are the most likely to have importance or significance. Go back and add connector words to create sentences and a poem. Use markers or paint to “blackout” the other words. Add colors, patterns, and images if you wish. Reflect on the message of your poem. Is it telling you something that you need to know? 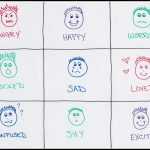 Is it expressing something that has been on your mind? Even if it doesn’t seem meaningful, how does it feel to try to stretch your creativity in this way? 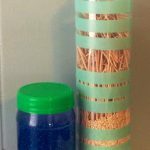 What is it like to have to work with whatever is available on the page? Share your thoughts in the comments below! 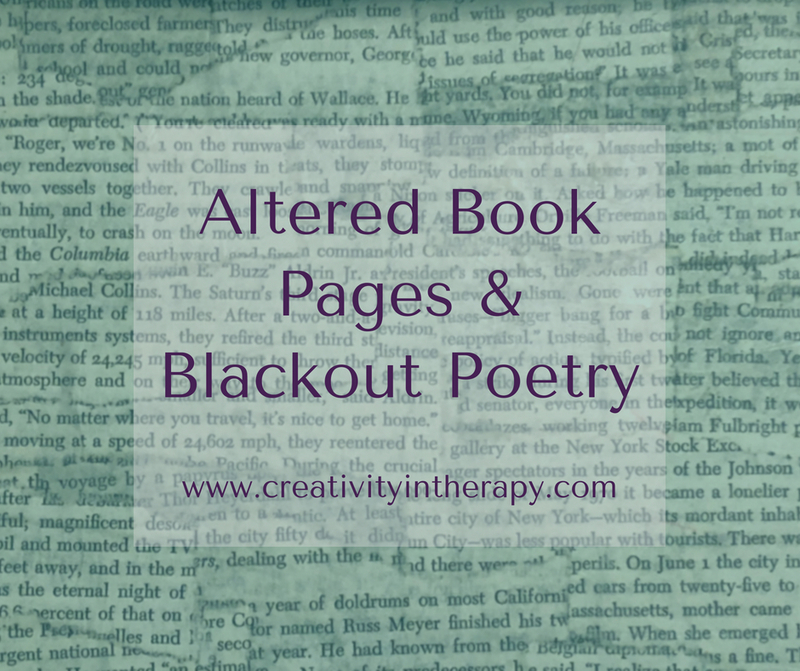 Do you use blackout poetry or altered books in your clinical work? 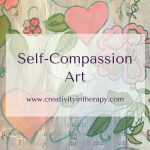 Have your tried these activities for your own personal self-expression and creativity? 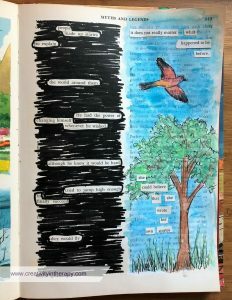 I just used black out poetry for a group art therapy session. It was a huge hit and the created poetry was quite powerful to all the participants. A few of the clients are continuing the work independently. That’s so great to hear! I always think it wonderful when people discover a creative activity in group and then continue to use it independently.